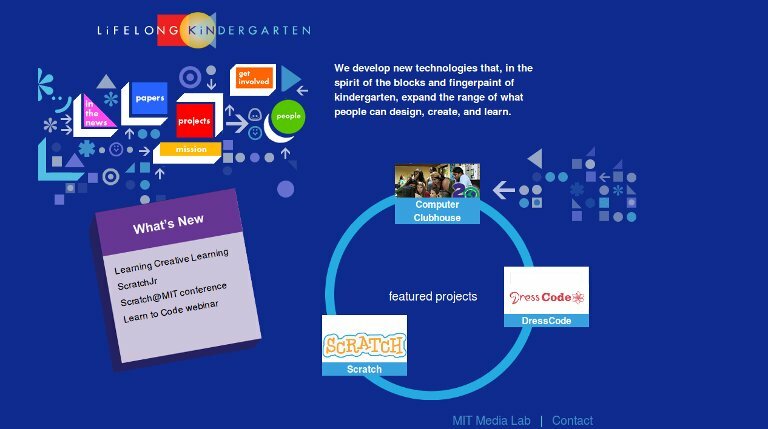 The Lifelong Kindergarten group is located within the MIT Media Lab, a hotbed of creative activity. In one corner of the Media Lab, students are designing new musical instruments. In another corner, students are designing new social-networking software. This type of activity makes the famous Media Lab a good place for learning, since people learn a great deal when they are actively engaged in designing, creating, and inventing things. Certainly, most children don’t get the opportunity to engage in these types of creative activities. In school, they learn specific facts and skills, but rarely get the opportunity to design things — or to learn about the process of designing things. Outside school, they interact with electronic toys and games, but they don’t learn how to invent new ones. In the Lifelong Kindergarten group, they are trying to change precisely that attitude, believing that it is critically important for all children, from all backgrounds, to grow up knowing how to design, create, and express themselves. They are inspired by the ways children learn in kindergarten: when they create pictures with finger paint, they learn how colors mix together; when they create castles with wooden blocks, they learn about structures and stability. The initiative wants to extend this kindergarten style of learning, so that learners of all ages continue to learn through a process of designing, creating, experimenting, and exploring. Their ultimate goal: a world full of playfully creative people who are constantly inventing new opportunities for themselves and their communities.